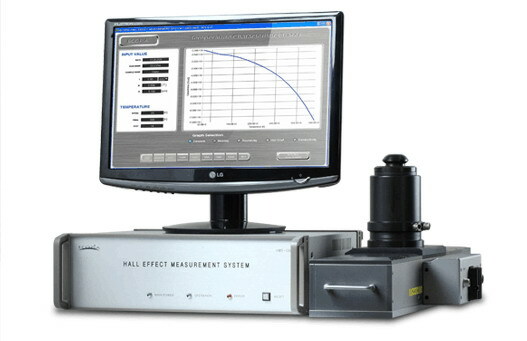 The HMS-7000 Hall Effect Measurement System has all of the same measurement capabilities of the HMS-5000, but with the ability to use the photonic light kit to expose the sample to various wavelengths of light during the test. Also, the HMS-7000 is compatible with the two high temperature kits that Ecopia offers. The HMS-7000 has automated magnet movement, variable temperature capability, and powerful analysis software. The HMS-7000 Hall Effect Measurement System is automated so that without user intervention, it will ramp to each user defined temperature, stabilize, make the measurement (including moving the magnet automatically), and then plot a variety of temperature dependent material properties. The system plots concentration versus temperature, mobility versus temperature, resistivity versus temperature, conductivity versus temperature, and Hall coefficient versus temperature. The systems provides the test results as tabular data as well as in graph form. The user defines the desired temperature steps within the range of 80K to 350K, fills the two LN2 reservoirs, and then the system automatically applies and switches the input current, measures the voltages, changes temperature, and moves the magnets all without user intervention. Once the test is finished, all of the temperature dependent graphs and tabular data are ready for viewing. The systems can be used to characterize various materials including all semiconductors including Si, SiGe, SiC, GaAs, InGaAs, InP, GaN (N Type & P Type can be measured), metal layers, oxides, etc. Sample testing can be performed to demonstrate the system’s capability. Testing of Temperature vs carrier density, mobility,resistivity, hall coefficient, conductivity, etc. Ecopia also offers the easy-to-use HMS-5000 Hall Measurement System with automated magnet movement, variable temperature capability, and powerful analysis software. As well as the econimical HMS-3000 Hall Measurement System with two measurement temperatures, i.e., 77K (LN2 temperature) and 300K (room temperature).